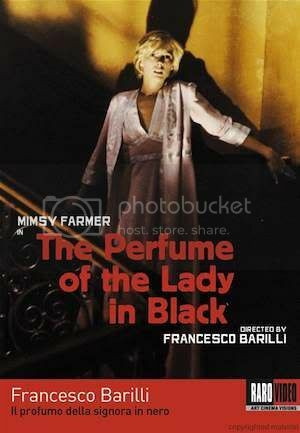 For the first time in the USA, we finally get a DVD release of Fracesco Barilli's psychological giallo, The Perfume of the Lady in Black (Il Profumo della signora in nero) from Raro Video. Starring the beautiful Mimsy Farmer (Four Flies on Grey Velvet), I really didn't know what to expect from the film. Is it horror? Is it an art flick? Is it good? Well, I'm here to answer all of these questions and more. The Perfume of the Lady in Black has Ms. Farmer as Silvia Hacherman, an industrial scientist who just might be going crazy. She attends a party with her boyfriend Roberto (Maurizio Bonuglia) at the home of an African professor, whose talk of voodoo greatly disturbs Silvia. Though the professor reveals it all as a joke, Silvia's psyche starts to unravel as she begins having disturbingly realistic flashbacks of her childhood. After more strange incidents occur, she starts to think that maybe someone is trying to drive her crazy. Eventually, Silvia loses all grip on sanity and starts seeing a younger version of herself along with the man who raped her mother. Frequently lumped in with giallo films (as I myself did in the first paragraph), The Perfume of the Lady in Black is a little harder to define. Part giallo/horror film, part psychological mystery and part arthouse film - there is just so much going on to categorize it under one genre. One thing that is for sure is that pretty much every aspect of this film is beautiful to watch. Even the more shocking scenes have a lush and vibrant quality to them that makes it hard to take your eyes off the screen. Mimsy Farmer also has a natural and innocent beauty that helps the film. Going beyond how good it looks, the story itself is quite interesting too. Though it's not the first film to follow a woman on a descent into madness, it definitely throws a few curve balls along the way that keeps you guessing until the end. As far as the horror aspects of the film, the gore is kept to a minimum other than one shocking scene that will make horror hounds cringe as they are howling for more. Raro Video previously released this title in Italy several years ago and it is great to have it available domestically. As with Raro's other releases, it is obvious that the company took great care in releasing a fine product. The transfer is out of this world and it includes both Italian (with English subs) and English language options. Also included is a nice little documentary on the film, with director interviews as well as a nifty little booklet. Overall, a great release for a nice little film that is sure to please psychological horror fans.